Certified welders to ensure quality. Own trucks to enhance on time delivery. Maintain an inventory of parts for components we re-manufacture. Most items can be shipped the same day ordered. Our re-manufactured components are painted with a two part high solids urethane paint. Our re-manufactured components are warranted against material or workmanship failure under normal use for one year (Excluding wear items). We will work to accommodate Program Rebuilds, Planned Shut Downs, and Emergency repairs to reduce down time. 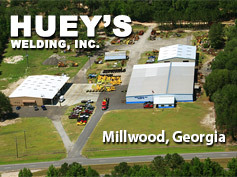 We believe Huey’s Welding would be an asset to your Ballast Regulator Fleet.